After a vacation at a friend’s house on the beach, I created this fun beachy Thank You card. I think I will actually use this thank you card template for many things — Birthday, Thinking of You, Hello, etc. For the card base, I used a piece of white cardstock, folded at the top 6″ across and 5″ tall. 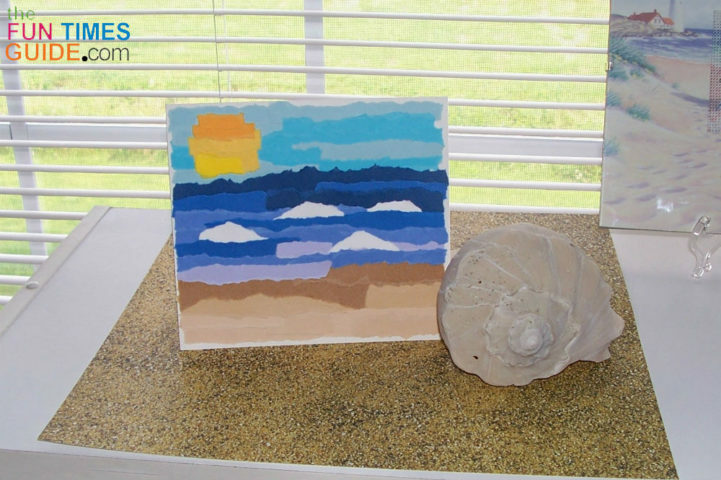 All of the beachy accents were made by tearing strips of paper — a simple idea that requires nothing more than leftover scraps of paper! My beach scene includes sand, ocean, sky and sun. I used my leftover paper scraps to tear strips of paper using the colors of each one. For the sky and ocean, I made strips of 7 different shades of blue, teal, and light purple. For the sand, I used 5 different colors. The strips vary in length, totally based on the sizes of scrap paper I already had. I kept the width between 1/4″ and 1/2″, although I did not measure them as I tore each one. I did learn that I had to use one hand to gently tear the paper while the other hand moved down the strip as a guide. If I just pulled at the top edge all the way to the bottom, the strip would take on a shape of its own rather than a somewhat uniform strip. I did want them to be thin strips — but other than that, the strips could vary in width. Through trial and error, I played around with the placement of the colors on my tabletop until I was happy with each of the elements. Then I took a picture with my cell phone — so I could get the placement just right on the card itself. There is really no wrong way to put the colors together. I wanted to have the darkest water at the edge of the sky, and the darkest sand at the edge of the water. To be consistent, I used the same process to make the sun. In order to use all of the colors I prepared, my card would have to be much larger than I wanted — so, on my white card, I started at the bottom of the sand and chose the best 3 colors. The ocean has 4 colors (plus the white caps), the sky has 2 colors, and the sun has 3 colors. The white caps are little crescents of white scrap paper. On the inside, I chose one of the sand colors and used it to cover the entire surface. To adhere each strip, I used Elmer’s extra strength glue stick. Before I used the glue, I set the strip on my card to make sure it was the right length for that spot on the card. I allowed each strip to overlap the one placed before it — so there were no white spaces showing through (although on the water it would look like white caps, and for the sky it would look like clouds). Most of the strips were shorter than the 6″ card, so I used 2 or 3 paper strips to cover each section of card — again allowing every strip to overlap the one placed before it. I made sure the glue covered the entire area of the strip, placing it face-down on a piece of old mail and allowing the glue to run over all the edges. I did not use a sentiment on this card, choosing instead to use a black Sharpie on the inside to hand write my note of thanks. It would be very easy to add a sentiment on the front or inside of this card if you choose. 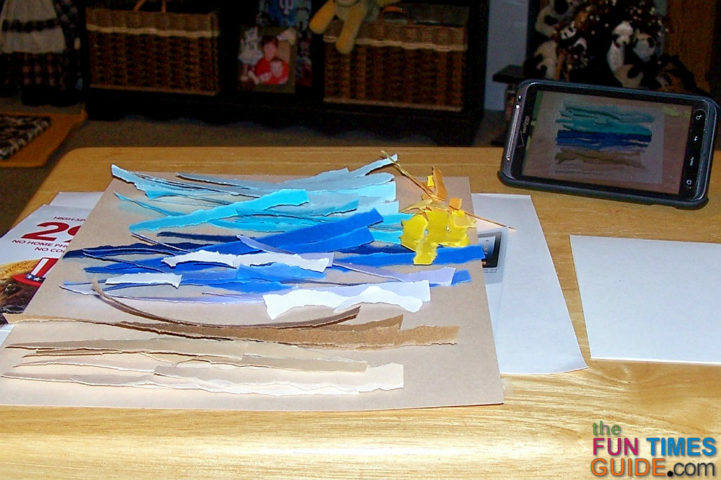 I used the 12″x12″ of sand paper shown to make the envelope from matching paper. Have fun making your own summer beach card. One thing’s for sure: each card is going to be a one-of-a-kind!